This weekend I went to Call to Arms, the annual convention hosted by the Wellington Warlords. As usual it was held in the main hall at St Patricks College. 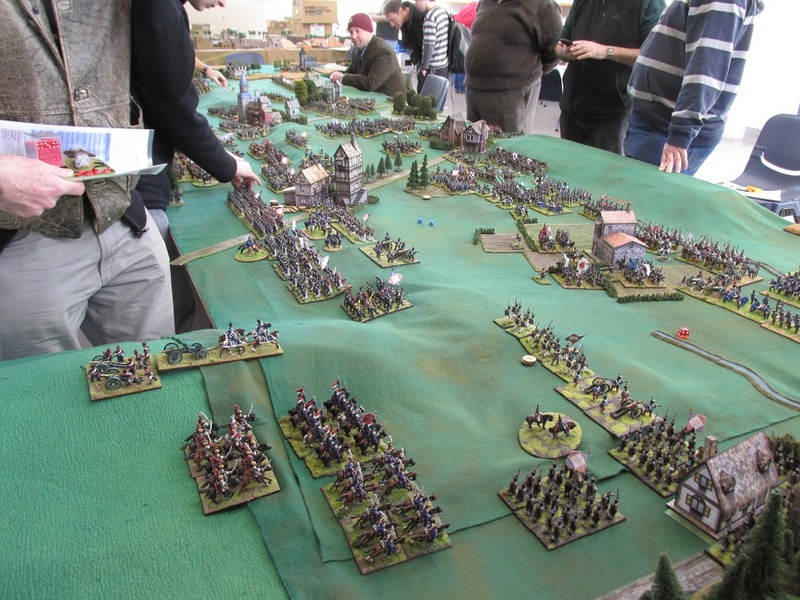 I was part of a large game refighting the southern front At Leipzig. I got to take on the role of Napoleon. 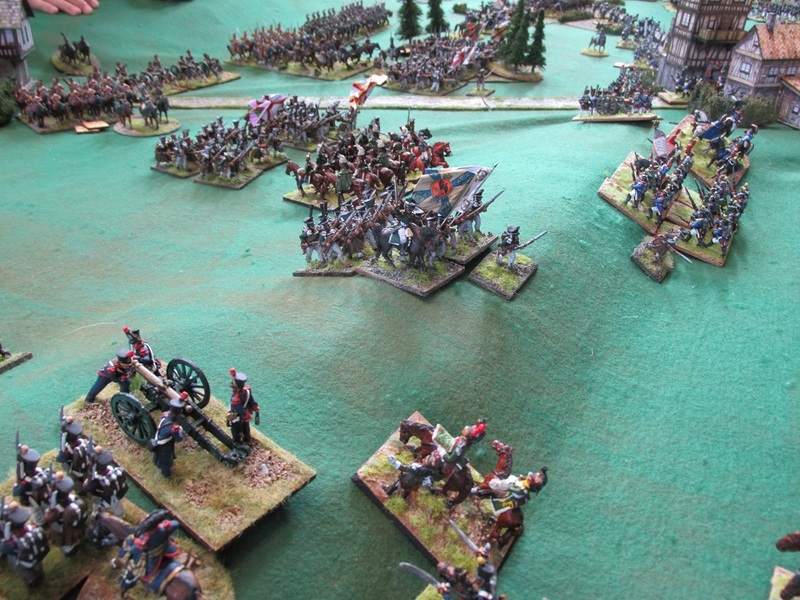 The game was organised by John Hutton and was played using a slightly modified version of Black Powder. I had seven subordinate commanders on my side, ranging from experienced Black Powder gamers to rank amateurs with the rules – like myself. The French forces consisted of a total of 64 battalions of infantry, 29 cavalry regiments and 17 and a half batteries of artillery. That lot included reserves that I could call on at various stages of the game. They included Latour-Maubourg’s powerful 1st Cavalry Corps, Pajol’s Fifth Cavalry Corps, the Guard Cavalry Corps (Nansouty) and the 1st and 2nd Young Guard Corps. John designed the game to allocate victory points based on firstly, objectives held or taken, enemy brigades broken, and in a neat move, removed victory points depending on the reserves called upon. This was to represent the fact that reserves used would be unavailable to other sectors of the larger battle. The original plan was to try to pin the Allies south of the line Markleberg, Wachau, Leiberwolkwitz and along the Kalberg Heights. Once they were pinned, we were to try to get them to commit their reserves and then throw the Guard and cavalry reserve into a hammer blow to break their line. Everything went according to plan except that we lost. We played from 08:00 until about 17:30 and at that stage we had fought ourselves to a standstill. The French held both flanks and had retaken Leiberwolkwitz (it had changed hands twice during the course of the battle). Poniatowski’s Polish Corps died to the last man defending the streams and small town of Markkleeberg, but had so badly hammered the attacking Prusssians that when his reserves arrived (Semelle’s 52nd Provisional Infantry Division) they managed to finish off the remaining Prussians. On the left flank, Macdonald’s Corps, consisting mostly of Provisional infantry fought a tremendous battle against Austrians and Russians, holding them off as they made a series of attacks along the Kalberg Heights. 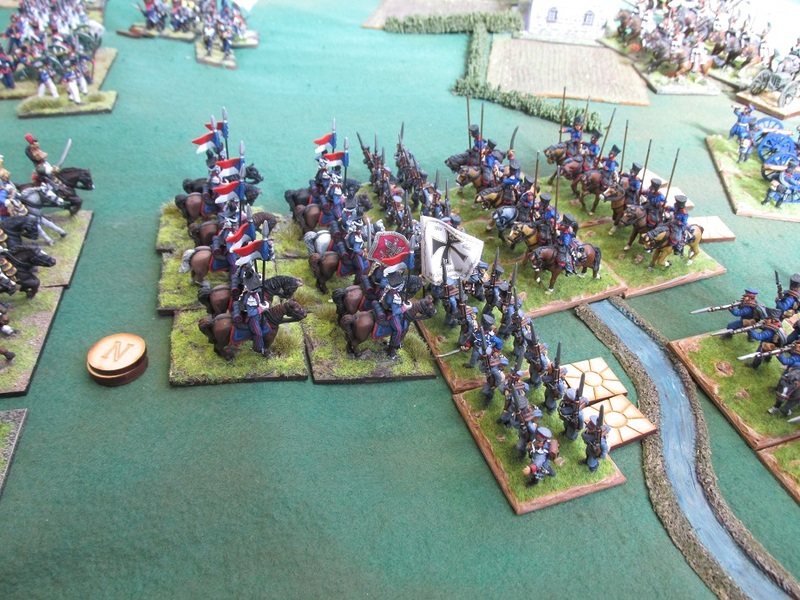 French Young Guard (OK a few proxies in use) attack along the Kalberg and throws yet more Austrians back down the hill. As in the actual battle, Sebastiani had to move his Cavalry Corps to aid MacDonald, it’s place in the centre of the line taken by the reserve 5th Cavalry Corps. Sebastiani got involved in a long running cavalry battle that eventually sucked in the entire Guard Cavalry reserve and almost all of the 1st Cavalry Corps. 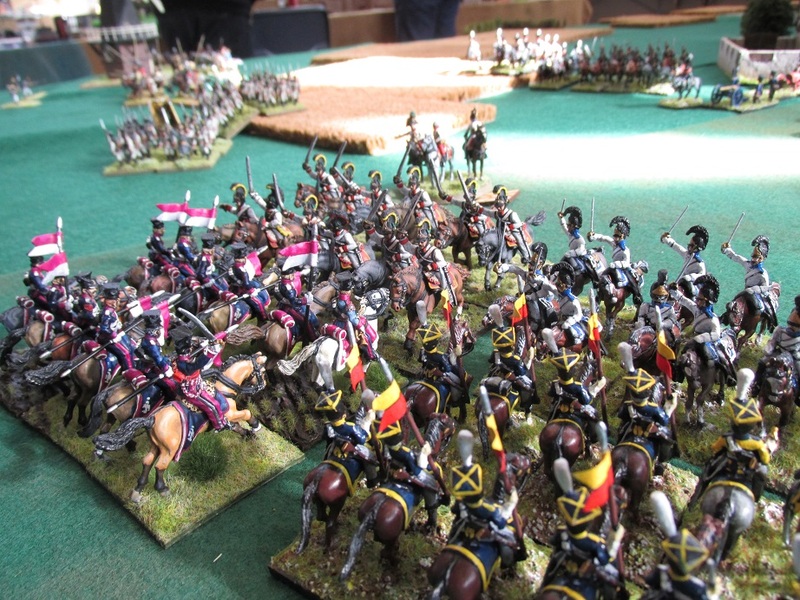 It was terrible throwing brigade after brigade of Cuirassiers and Guard cavalry into the huge melee that chewed up the cream of the French cavalry, even thought at the end of the day they were victorious. A pyrrhic victory indeed. In the centre, attacks against the Russians between Leiberwolkwitz and Wachau stalled and a Young Guard Division was committed to retake the town when it fell. Unfortunately, one battalion was destroyed in it’s first contact with the Russians, and another broke trying to take the town. 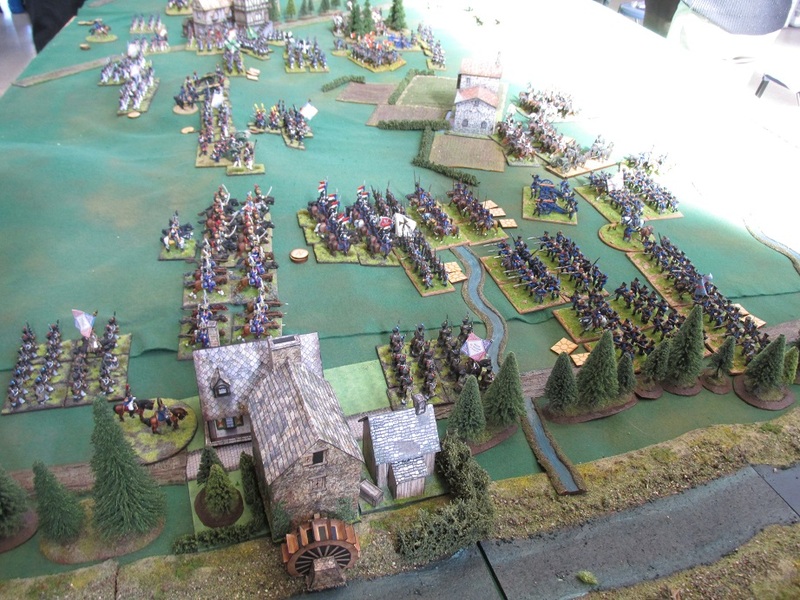 The entire brigade fled a this point and another complete Young Guard Corps was finally committed to retake the town – which it did on the final turn of the game. Another division of Young Guard were sent to help MacDonald and they threw the Austrians off the Kalberg Heights and destroyed them, although at a high cost. A Russian battalion crest the ridge between Wachau and Leiberwolkwitz. 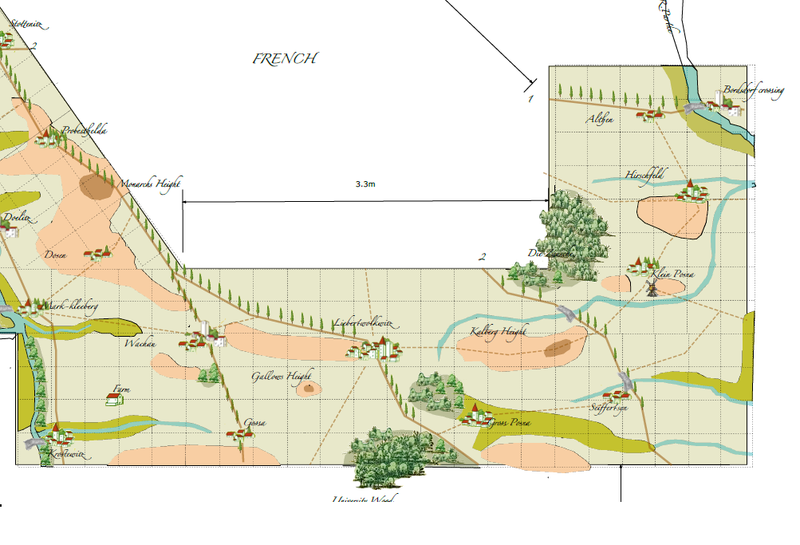 The bright spot in the French line was Marshal Victor’s II Corps who held Wachau and it’s environs for the whole game and was the only French commander who confidently said that he could hold with what he had and did not make demands on the reserves. MacDonald’s Wurtembergers and Provisional Infantry on the Kalberg Heights face the first Austrian Corps to attack them. 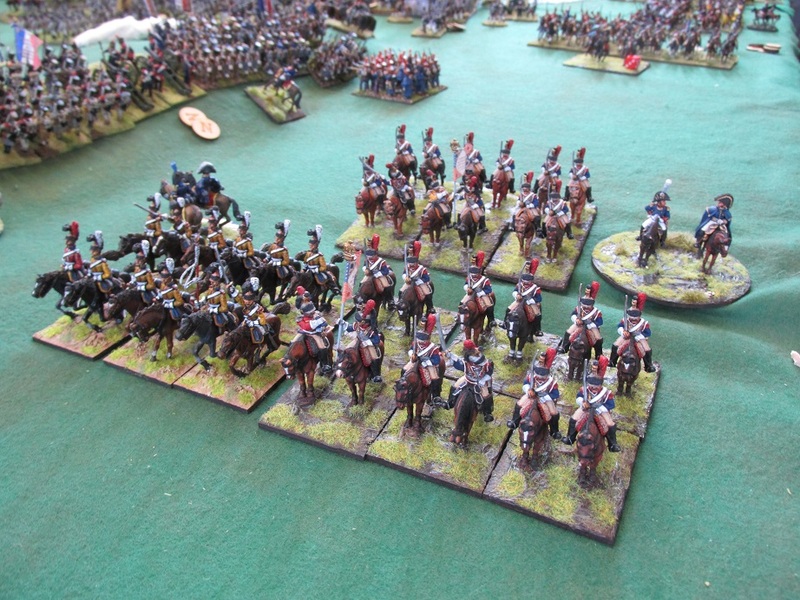 St Germaine’s 2nd Heavy Cavalry Division (II Cavalry Corps) relocates to the left flank. When the game finished the French held the important towns, denying the Allies a decisive victory. Unfortunately the cost of the defence had been so high in broken brigades that we lost on points. It was a great game and once again I do not think we would have got so many turns in using any other rule set, and actually get a result. 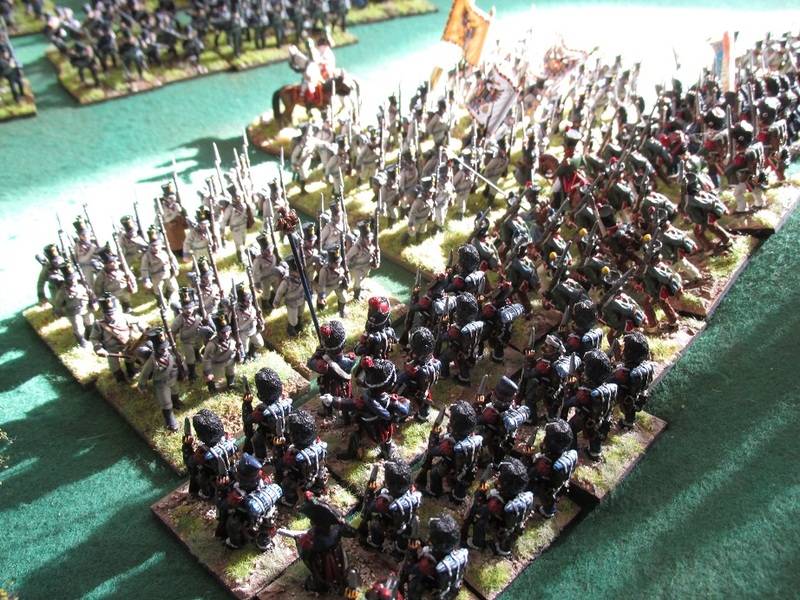 At the end of the game a total of 144 battalions (3,456 figures), 59 cavalry regiments (708 figures approx) and 38.5 batteries (77 guns) had been used. Many thanks to all involved. A great day of wargaming cameraderie. Make four saves. Yeah – you know the rest…. Huge game, tons of beautiful troops, attractive table, lots of players, and a close fought result! Doesn’t get much better than that! Hi Peter. We played from 08:30 until about 17:30 at a fairly steady pace – so nine hours including breaks. 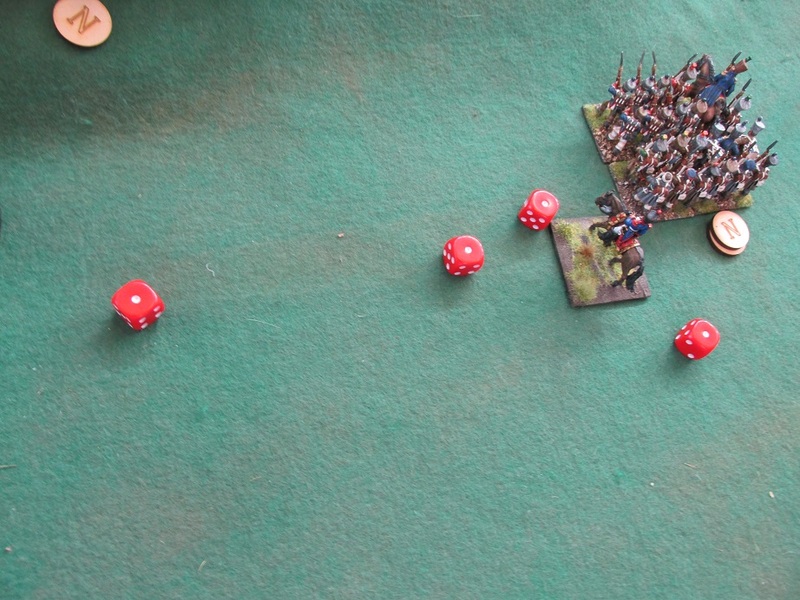 I think the thing to note is that Black Powder really does work for big games. Bear in mind this edition of Leipzig was a massively scaled down version of the one John organised for us to play last year. Looks great Brian, well done to all for putting on.